Seren, Doc and Adam in this episode are joined by the writer of Moon Girl and Devil Dinosaur – Brandon Montclare! In this episode we have a guest! 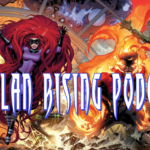 Devin Grayson joins us for a discussion on Marvel Rising among other things, we discuss the gaming culture, the current state of the comics fandom among other things. We hope you enjoy this episode as much as we did making it.